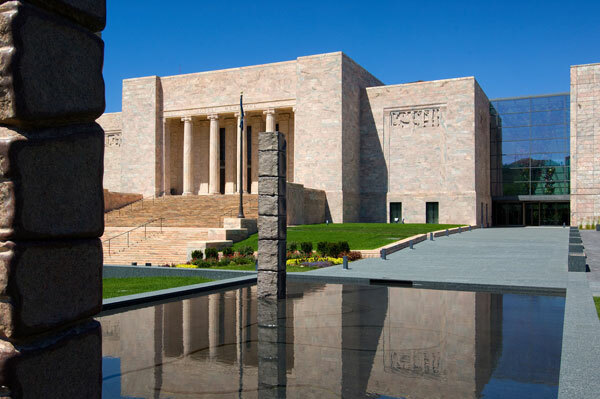 The dramatic entrance to the Joslyn Art Museum promises more to come. James and I met through mutual friends. At the time, the idea of a new relationship wasn’t on either of our immediate radars, but the ease of conversation, loads of laughter and a similar devotion to our families made it easy for two divorced people to slowly sink into something truly wonderful. After almost a year, we thought it was time for our children to meet each other. I had met Brian, James’ college freshman, several times; James had met my two high school-aged daughters, Hannah and Ellie. But we were having a difficult time deciding where we should have the kids meet for the first time. Movies weren’t interactive, restaurants could be too distracting and getting together at one of our homes might be intrusive. 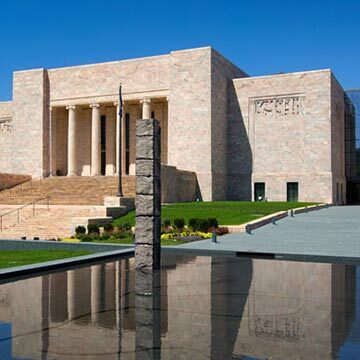 So we decided to take the kids to one of the places we went when we first began dating: The Joslyn Art Museum. 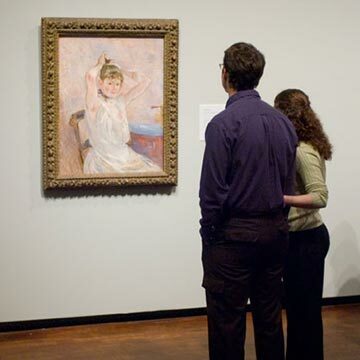 The Joslyn’s permanent and temporary art exhibits include works from Renoir, Rembrandt and more. Speaking from experience, it’s the perfect place for a first date or family outing (the free parking and admission doesn’t hurt, either). 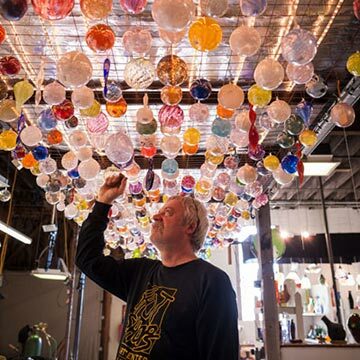 Dramatic glass sculptures by Dale Chihuly make a splash. We meet in the lobby and, of course, it’s a little awkward. We introduce the kids and there are short “hey” and “hi” responses—I couldn’t be sure if they actually looked at each other or not. “Ok, then!” James says a little too loudly with a nervous, over-the-top, but totally adorable grin. 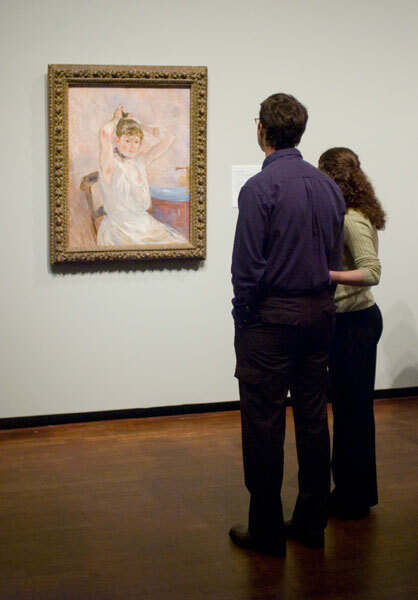 “Who’s ready for some art?” Murmurs from the kid trio ensue. James moves to hold my hand but a side-glance from my eldest, Hannah, squashes that. “Just breathe,” I tell myself as I try to remember that this is a big step for all of us. Oohs and aahs break the silence as we climb the grand staircase to the upper level. 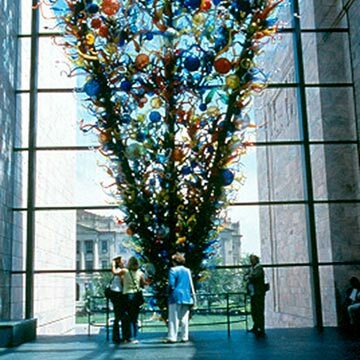 Two gigantic, colorful and shiny blown-glass sculptures by Dale Chihuly anchor both ends of the vast lobby. One looks like a collection of marbles, or Christmas ornaments; the other, an upside-down Christmas tree—both include every color of the rainbow. 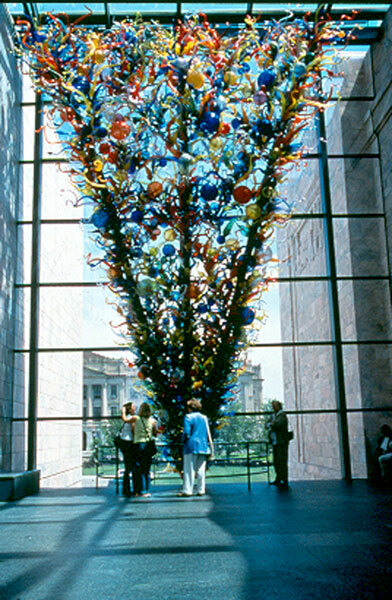 The colossal installations are improved only by the glass roof above the Joslyn—the sunshine plays off each piece of the blown glass. “Umm, could you take a picture of me in front of this?” Ellie asks Brian. “Yeah, of course,” he replies, as he reaches for her phone to take a snap. “Good?” he asks when he hands it back. “Good!” Ellie responds with a smile. 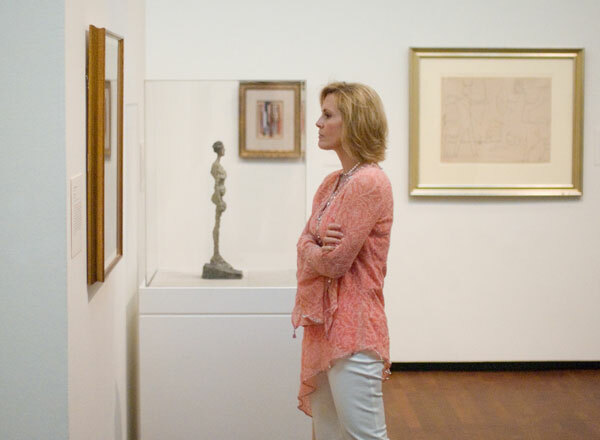 Silence returns as we slowly wander through the galleries—which is normal, but right now silence seems so loud. In the Center for Western Studies, we end up in front of watercolors and drawings of the American West. I’m hoping that the kids are feeling a little more comfortable with each other when James catches my eye and nods his head to the exit. In the Rights and Reproductions exhibit, we gaze at photos from calendars, film, video and television reproductions. I’ve been staring at a picture so intensely, I’m caught by surprise when I see Hannah, Ellie and Brian in front of a frame to my right. I missed who went over to whom, and who said what first, but the group was talking about their hobbies and extracurricular activities. Maybe someone had asked about photography? All I know is that this lovely museum has had the same effect on the kids as it did on me and James when we first walked these halls. How could it not? 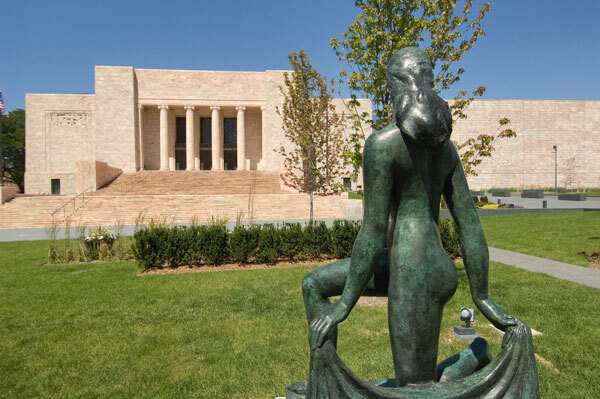 With so much art to look at, discuss and debate, the Joslyn is the perfect place for families and families-to-be. 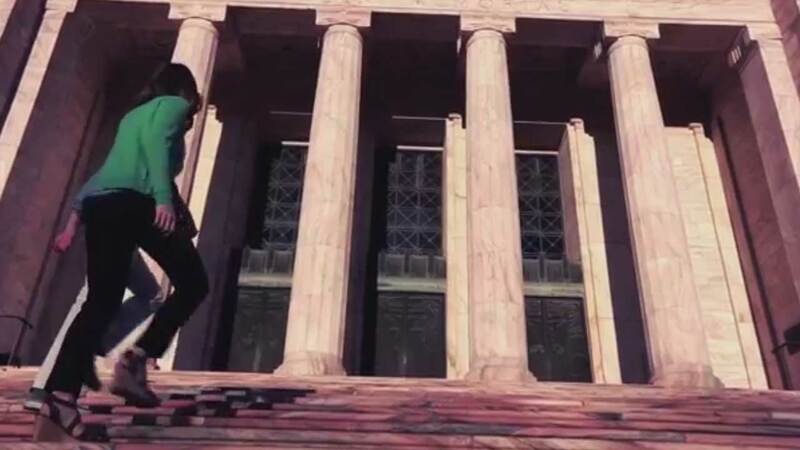 “I saw that one in art class,” says Hannah, pointing to a replica. “Oh, it’s cool,” adds Ellie. A fun, albeit loud debate suddenly ensures between the kids. “At least they’re engaged,” I muse to myself. Far from being silent, now they’re a little too noisy. “Come on everyone, I have an idea,” James says. We hop into James’ SUV, the girls in the back, boys in front. 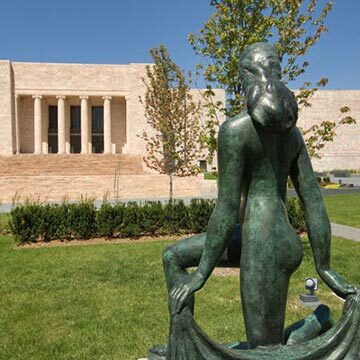 We are going to the Hot Shops Art Center in downtown Omaha for what James promises will be a different kind of art experience. 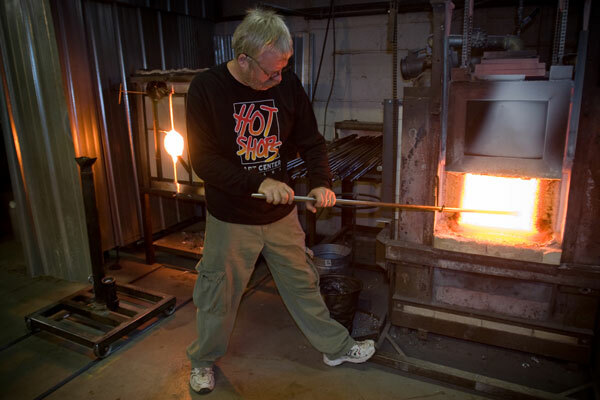 Watch the experts blow glass at Omaha’s Hot Shops. I, myself, love the Hot Shops. Three floors of art studios in what used to be an old mattress factory that now houses showrooms and gallery spaces with an incredible variety of talented artisans. These artisans are just as passionate about their work as they are about sharing it with the public. “O-M-G, Mom, take a breath,” Hannah laughs. Ellie and Brian crack up. The kids are laughing and James and I know it’s at our expense. But this teasing from our bonding trio is welcome and we cannot help but smile. “Oh, what the heck,” James says as he grabs my hand. All three kids groan in a mockingly disgusted manner, but they are still laughing. 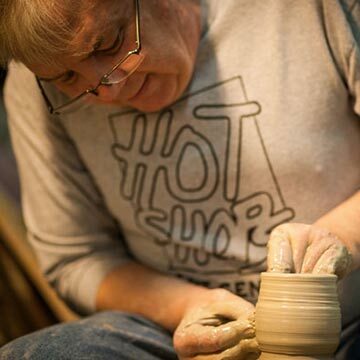 Witness of the art of pottery making. 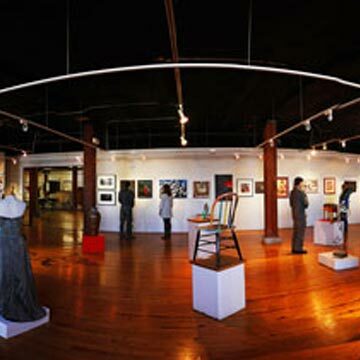 Both of our families enjoy walking around the art center and stopping in to visit the gallery spaces of more than 80 studio artists. 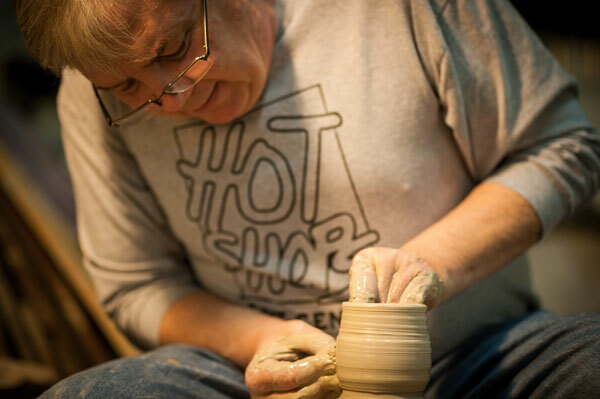 We stop for a few minutes to enjoy a potter creating a piece, all of us attempting to interpret what it might become. Laughter erupted at Brian’s tongue-in-cheek, “I think it’s a pot” guess. 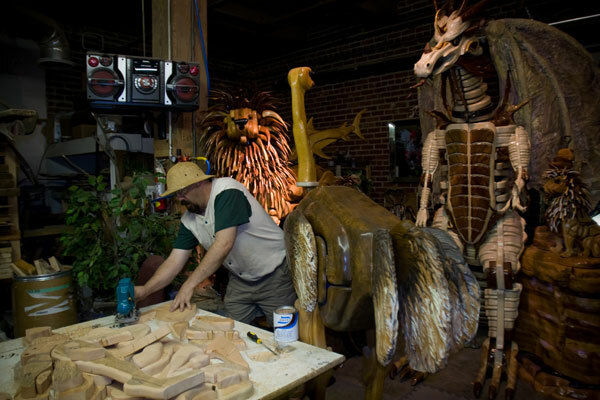 Next we visit the sculpture of Les Bruning, one of my personal favorite areas within Hot Shops. 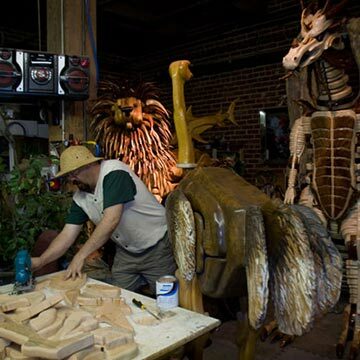 Les’ sculptures can be found all over Omaha and beyond, and he has been commissioned by famous clients such as Boys Town and Yoko Ono. “Who is Yokono?” Ellie asks. James bursts out with a hearty laugh at her mispronunciation and explains Yoko Ono’s significance to her. “Oh,” says Ellie, clearly not impressed. Yet she smiles at James and I am over the moon. The Hot Shops Art Center was perfect for the second half of our day. With the kids more comfortable (and still a little loud) they were able to chat away with each other and the artists working their crafts. The artisans were so engaging with all of us and answered questions, explained the artistic process and were, in this mom’s opinion, simply wonderful to interact with. The Center itself was easy to navigate and had a really cool and hip vibe. This was a great bridge for the two families to come together. I felt cool and hip, too, and growing more and more comfortable with this new blending, much like the paints and clays used by the artists. We end our visit in the Crystal Forge, which is noted by Hot Shops as the heart of the center. 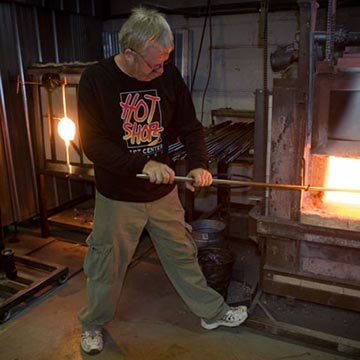 Here we watch glass blowing and learn about the studio’s annual open house, where the public can watch demonstrations and purchase hand-blown glass items. “I want to come to the open house,” Hannah says. 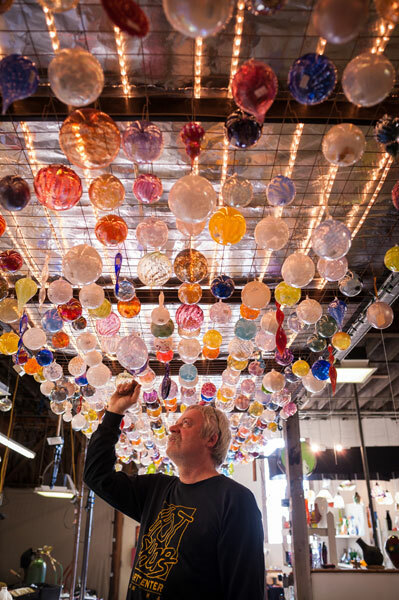 “Maybe I can become the next Chihuly.” “We’ll let Yokono know,” jokes Brian. We are all laughing out loud, together. Wow. We walk to the parking lot and off to dinner. The three kids are ahead of me and James, giggling about something we cannot quite hear. I reach up and quickly kiss James on his cheek. As we drive off, I smile to myself and know that the process of blending families is much like creating beautiful art. With time, patience and lots of love, we can and will create our own masterpiece. 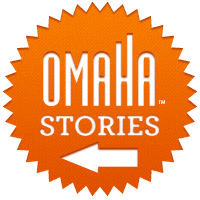 Discover more of Omaha’s amazing arts and culture.